Hello, friends! I’ve missed you. I’ve been a busy bee. I got hired onto a contract-to-hire position at a consultancy for whom I’m working on a Chef project. I’m having a great time because I’m learning so much. To say that I’m drinking from a fire-hose is an understatement. But I definitely want to slow down and share some breakthroughs so that I can remember them for later and hopefully help some of you out along the way. Okay, so at first I was just hard-coding the network_host in my config because I just wanted to get it to work and I didn’t really know how to get it from ohai. Even understanding how attributes work took me a while to get up to speed, so then the complexity of using a complicated ohai value alongside attributes with node hashes and how it affects my kitchen.yml proved challenging for me. Let’s just say there was more than one whiteboard session with my favorite tutor. But I really needed to get it from ohai so that the setup of the cookbook would be simpler. The thing that made it complicated to me was that there were so many IP addresses floating around with my multiple virtual machines in the elasticsearch cluster, and I had a hard time wrapping my mind around which was what. I had 3 nodes, one of which was a master/host, and I didn’t know which IP address in ohai was going to be the one I needed to use for network_host. After it was open, I did a search using Ctrl +w for “Where is”. I knew my hard-coded IP address, so I searched for that. When I found it, I was stumped for a minute. 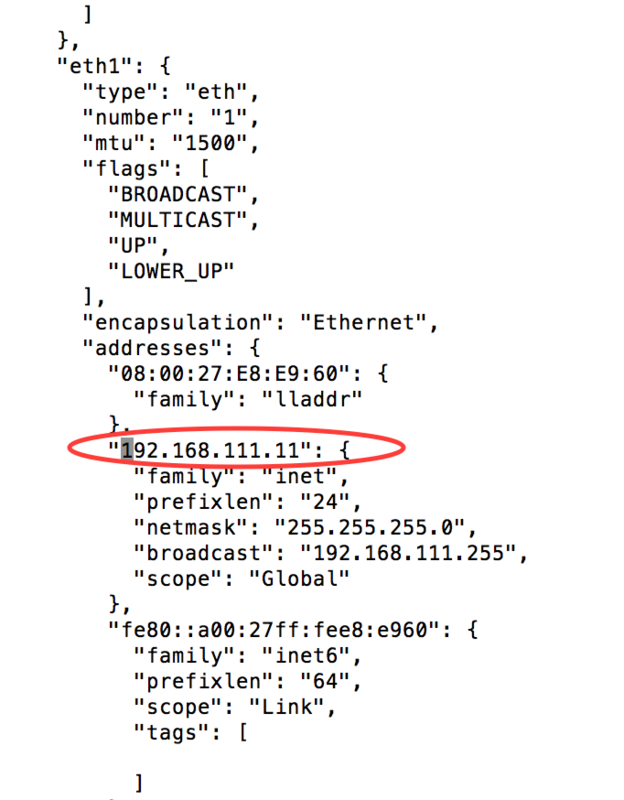 But then I realized that with this information, I could map out the structure in which the necessary IP address was. If I knew that structure, then I could code against that structure to map to my IP address, right? Right. So how to do it? Well, I don’t know how you would have done it, but here’s what Michael and I worked out on Labor Day. In a resource that was serving as a default yml for each of my nodes, I had the following code (only showing you the pertinent info). So if we take it chunk by chunk, you can see what we did here. 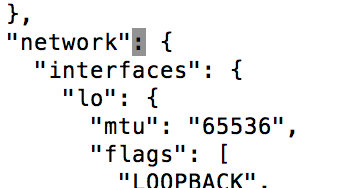 When we scrolled up in our ohai.txt, we could see that at the top of the tree was the "network" and then the "interfaces" branches. So we needed to start there and climb down. "interfaces" had three different keys: "lo", "eth0", and "eth1" - in that order. And our IP address was in the last key for that branch, so you see what we did there. So then I wanted to say that my network_host IP address was in the same branch of the tree or key that had the family key equal to inet. And that did it! I was able to call that variable in my config. Everything seems hard until you break it into small, bite-sized, manageable chunks. I didn’t want to deal with this issue, and so I put it off until the very end. But when I sat down, talked it through, and mapped it out with Michael, it was suddenly much more manageable. Sounds a lot like life!